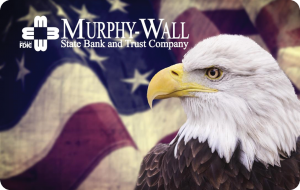 All year long, Murphy-Wall donates a portion of our Instant Issue Card (pictured below) issue fee to the Wounded Warrior Project, a nonprofit charity and veterans service organization that offers programs, services, and events for wounded veterans of the military actions following September 11, 2001. As we prepare for Veterans Day 2018, this year we are offering an added salute to all those who have served. We would love to see all or part of your uniforms! * While supplies last. Proof of service may be required.